Another feature of Tune Sweeper is that it can analyze your iTunes library and display your musical tastes as multiple graphs. You can access this by selecting the 'iTunes Statistics' tab at the top of Tune Sweeper. 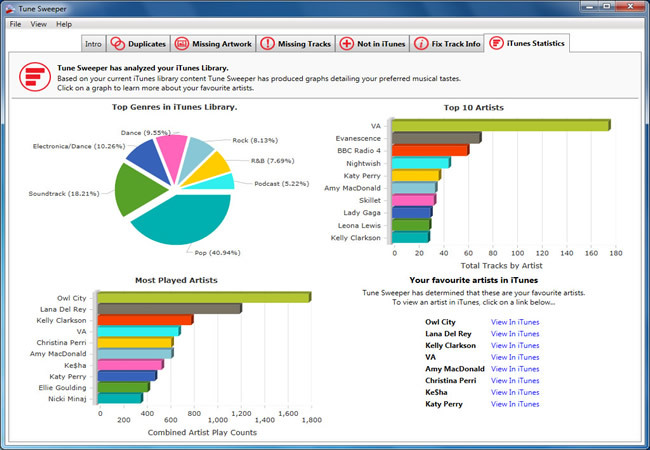 Top Genres - This is a pie chart displaying your top genres within iTunes. These are determined by the percentage of tracks within your iTunes library that have each genre. Top 10 Artists - This is a bar chart displaying the top 10 artists whose tracks you have the most of in your iTunes library. Most Played Artists - This is a bar chart displaying the top 10 artists whose tracks you have played the most. Your favourite artists in iTunes - This is a list of artists that Tune Sweeper has determined to be your favourite artists. You can also view each of your favourite artists within iTunes by clicking on the 'View In iTunes' link next to each one.